This is the heart of the company, from here come the solutions that allow us to fully meet the demands of our customers. A first Class staff consists of nine technical operatives - a biologist, a chemist and seven legal chemists, whose basic training has received specialist additions from the company together with courses and seminars with consultants and external experts. A wealth of knowledge to which Ferrini holds especially is the fruit of “quell’apprendere” daily: that there is no substitute for professional growth at the highest levels. 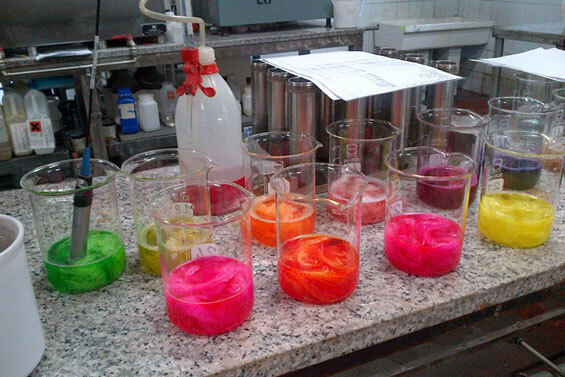 Research and development, selection of dyes, recipe archives (tens of thousands of recipes fill our archive), quality control, support to the controls of the systems, these are just some of the tasks performed by our technicians to ensure that our products are always at the top for our loyal customers.